This article was written by Ben Finholt. Our long national nightmare is over. The worst kept secret in disc golf is out, as Paul McBeth and Discraft finally announced a new four-year deal. Discraft, once the clear second choice to Innova, has made a stunning move as it attempts to regain ground in the industry. McBeth’s partnership with Innova was the most successful sponsorship of the modern professional disc golf era. Discraft, in contrast, is a company in transition. With this move, McBeth is making a huge bet on himself and his brand while Discraft is pushing a lot of chips into the middle on McBeth. Are these good bets? That depends on the respective value of players and companies, a topic that has only recently been worth exploring. Lucky for us, McBeth and Discraft just designed the perfect experiment. Prior to 2006, when companies like Latitude 64 and Discmania entered the disc golf market, there were only 10 companies producing PDGA-legal discs. Of those 10, only five are still regular producers of discs used by professionals: Innova, Discraft, DGA, Gateway, and Millennium. At the end of 2005, Innova led the way with 76 approved molds, but Discraft was close behind with 60.1 Discraft was the only realistic choice other than Innova when Dave Dunipace’s patent expired and the market was flooded with new manufacturers. There are now 30 companies actively producing more than one mold. In an article about her split from Discraft, Elaine King described how her time with the company ran out when the founders stepped back from day-to-day work and a new marketing plan was developed that didn’t include the five-time world champion. 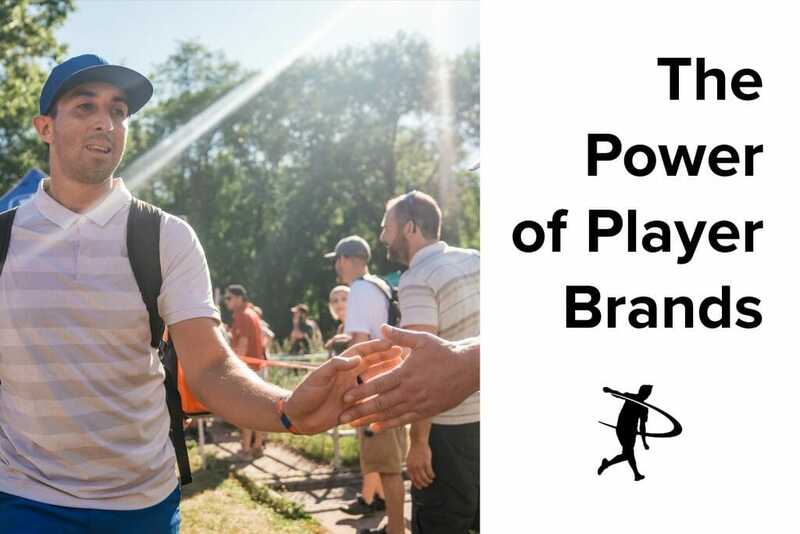 The moves were a reaction, it seems, to Discraft’s realization that the company’s status had waned along with its presence on the professional touring scene. Under the new plan, the team’s top pros — Nate Doss, Valarie Jenkins, Tim Barham, and Michael Johansen — would receive tour series discs. Rising star Austin Turner was eventually included in this group as well; the company’s failure to do the same for King is what precipitated her departure. While Barham and Johansen are more properly classified as elite regional pros based on their limited touring schedules, Turner looked like the future. He hit the road with Jeremy Koling in 2017 and quickly became a fixture near the top of leaderboards. He won the Nantucket Open (beating a dozen well-known pros) and two other B-tiers to go with top 10 finishes at six A-tiers and three Disc Golf Pro Tour events. He finished fourth in the PDGA National Tour standings and seventh at Pro Worlds. He ended the year rated 1017. Heading into 2018, Discraft had a new plan, a rising star, and two of the all-time greats in Doss and Jenkins. Early in the year, the “Discraft is Back” ad premiered during Jomez Pro videos. Then Doss injured himself early in the season. Bevel Craft Brewing, the venture he and Val started, became a physical reality late in the summer when they signed a lease on a taproom space; the couple hasn’t played a tournament since the Zoo Town Open in mid-July. In addition, Turner had a down year. He won just one B-tier and finished top 10 at only one A-tier. He was 34th in the NT standings and 75th at Worlds. He is currently rated 1009. These developments brought Discraft to a crossroads. With Doss and Jenkins becoming full-time brewers, Discraft’s most visible touring ambassadors were gone. Discraft did not have anyone in the top 25 of DGPT points.2 It was put up or shut up time for Discraft’s disc golf business. While the company’s position in ultimate is even more dominant than Innova’s in disc golf, participation in disc golf is growing while ultimate numbers are flat. A move around the edges wouldn’t have helped. Signing a Paul Ulibarri or Kevin Jones would have opened eyes. but there’s only one person who can get disc golf fans to buy seemingly any disc he throws. I used to carry a Nova. About four years ago, at a doubles event, I got interrogated about it. The old-school golfer questioning me wrapped up his investigation with, “The new junk is just that.” Then Paul McBeth and the rest of the chase card stepped up to the second hole at Deer Lakes Park during the fourth round of Pro Worlds in 2015. With Central Coast Disc Golf filming, McBeth threw his Nova 270 feet uphill on a rope. The hole is 276 feet. McBeast mode was activated, and we soon had 4x Novas on every Play It Again Sports rack around the country. In addition to his four world and two United States titles, McBeth has almost certainly made more money as a disc golfer than anyone in history. Along with the Nova, he had four other signature discs with Innova: Destroyer, Krait, Thunderbird, and Roc3. Innova also produced three tour series discs for him. His Teebird3, McPro Roc3, and McPro Aviar sold out every time they were released. Legend has it that he carried the Krait, not a very popular disc, just to prove how much product he could move. Despite his competitive and financial success, McBeth has consistently sought opportunities not normally afforded to disc golfers. In this way, he is the closest thing the sport has to LeBron James. James took a throwback jersey salesman named Rich Paul and created Klutch Sports, a top-flight NBA representation firm. There were no disc golf agents at all until McBeth agreed to join the DGI Group. James didn’t simply accept a sponsorship from Beats Electronics, he got a stake in the company and was rewarded when it was acquired by Apple. McBeth was the only disc golfer who refused to continue his Adidas Terrex “sponsorship” when the company wouldn’t pay him in cash rather than shoes and apparel. Their respective free agent moves are similar as well. Both appear to be sacrificing short-term competitive advantages in search of long-term industry impact. James gave up the security of a franchise that bent to his will and an easier path to the NBA Finals. McBeth will lose Innova’s market dominance and discs he’s been throwing his entire pro career with great success. However, LeBron James will never be the greatest Laker of all time. Kobe’s jersey is in the rafters and his boss is Magic Johnson, so he’s not even the most popular guy currently working in the Staples Center. McBeth, in contrast, is now the sun around which Discraft’s entire disc golf team orbits. At Innova, McBeth was the heir to The Champ. He was never going to be his own brand. Innova is bigger than any one disc golfer; Discraft is not. While McBeth mirrors LeBron in his business dealings (at a much, much smaller scale), he most closely resembles Tiger Woods as a competitor. Like Woods, McBeth has taken his sport to new heights, raising the bar for competition and compensation. Both were aided by advances in technology that allowed for longer, straighter flights. Both are clutch on the putting green. McBeth’s reported deal with Discraft is also reminiscent of Woods’ with Nike. Both are the richest ever given to a golfer. Discraft appears to be willing to cater its disc golf business to McBeth, and Nike’s golf hardware business (clubs and balls) was invented out of whole cloth for Woods. Few other disc golf companies have the security blanket that Discraft’s ultimate business provides, and Nike certainly had the capital to jump into golf with both feet. The downside for Discraft is obvious. Like Tiger, McBeth has struggled with back issues. When injuries forced Woods out of the sport for a time, Nike could not sustain its business selling clubs and balls, despite having Rory McIlroy under contract as well. The company now makes only golf apparel. An injury to or drop in performance from McBeth may not be as painful for Discraft, but they are committing a lot of capital to him. This is a fascinating moment for disc golf. During his appearance on The Upshot after the DGPT Championship, Nate Sexton discussed the way his commentary role with Jomez Pro had furthered the growth of his personal brand. How much effect does the Sexton brand have on disc sales? His Firebird is a hot commodity, but the percentage of its popularity attributable to Sexton versus the desirable flight of the disc is an open question. The only way for Paul McBeth to answer this question for himself was to untether from Innova and take his talents to Michigan. He bet on himself with Adidas, and it worked for a while. But no real contract ever materialized. If McBeth wants to get Adidas or any other major retailer back to the negotiating table, there is no better way than showing that he is not reliant on a particular manufacturer. Massive success for McDiscraft would show that investing in players is the way forward for disc companies. Just as a LeBron James team will inevitably win games, McBeth can show that his signature will sell discs. We’ll also get to see just how dominant Innova remains. There’s no doubt they’ll comfortably survive McBeth’s exit. But a McBeth-Discraft failure would remind everyone that the competition has a long way to go to catch the first company to patent a bevel-edged disc. The experiment is running. Now we just wait for the results. Comments on "McBeth Wants To Build His Brand. Will It Pay Off For Discraft?"